How many of you looked at the Feel Goods stamp set on page 21 of the Stampin’ Up Spring Mini? The set has 5 large messages, and I think they are ALL Great! Two of the sayings are shown on the cards below. The other 3 are: “she Believed she could…so she did;” “Laughter is the shortest distance between two people;” “those who bring Sunshine into the lives of others cannot keep it from themselves. “ These are just awesome messages in my book, and truly will make someone FEEL GOOD! 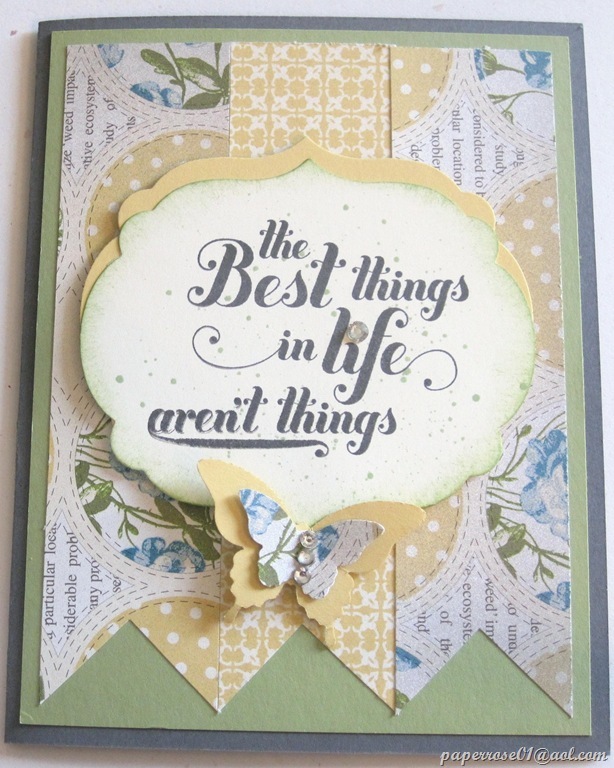 A background of Tea for Two Designer Series Paper seemed perfect for these gentle cards. I cut the DSP into 1 1/4” strips and used the 1” square punch to form the banner. These banners have been precut for you. 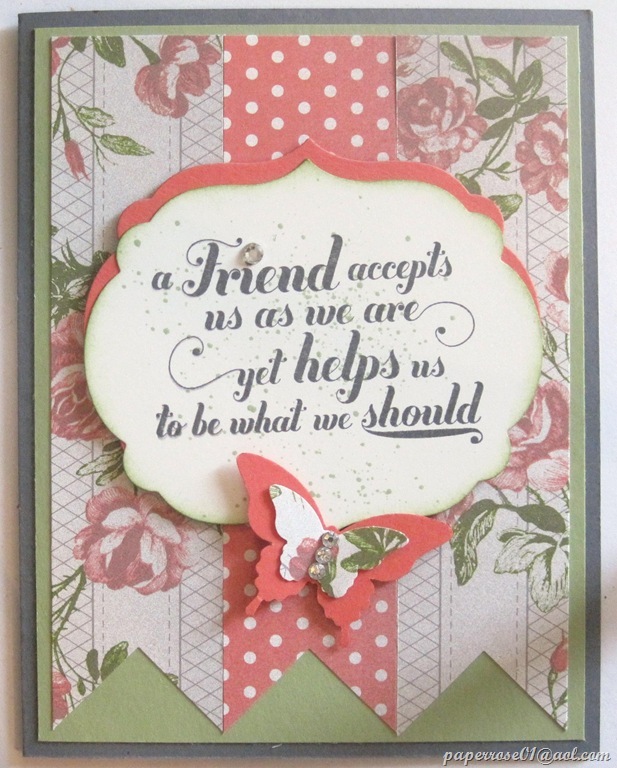 The Feel Goods message was stamped in Basic Gray on Very Vanilla cs, die cut with the Labels Framelits, sponged in Pear Pizzazz and spritzed with Certainly Celery. Labels Framelits in Calypso Coral and So Saffron have been pre-cut and provide a shadow for the message. The Elegant Butterfly punch was used to pre-cut coral and saffron butterflies. The smaller butterflies have been pre-punched with the Bitty Butterfly punch from the Tea for Two DSP. I added 3 rhinestones to the back of the small butterfly. Extra Bitty Butterflies have been pre-punched to use inside the card. So this is the end of the Rhapsody Rhinestone Stamp Camp – 4 cards – a peacock, a dress, a Swallowtail butterfly, and a card to make you feel good – PLUS – your own package of rhinestones. All of this for $12.00! I hope you can make it this weekend. If you think there’s a chance you will be coming, please let me know . If you decide at the last second to come and stamp, I guarantee we will have enough packets. I’ve missed several of you and hope you will be able to come. Next month will be entitled “Mostly Male” and guess what – we will be making cards for the guys! We will be taking a summer stamping break in July and possibly August.